Very Good. 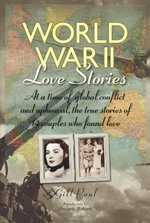 The Second World War played havoc with millions of lives, and all over the world lovers were pulled apart, often just as their stories together were beginning. This book tells the tales of 14 very different couples. 192 p. Love Stories . 200 colour illustrations. Good. The Second World War played havoc with millions of lives, and all over the world lovers were pulled apart, often just as their stories together were beginning. This book tells the tales of 14 very different couples. 192 p. Love Stories . 200 colour illustrations.